He reversed a transaction on PayPal that we did on bitmarket.eu, just before they stopped allowing users to pay with it. I hadn't realised how easy it was to dispute money with PayPal. Have been using Moneybookers since then, without any trouble, but won't anymore. that's what struck me as well. 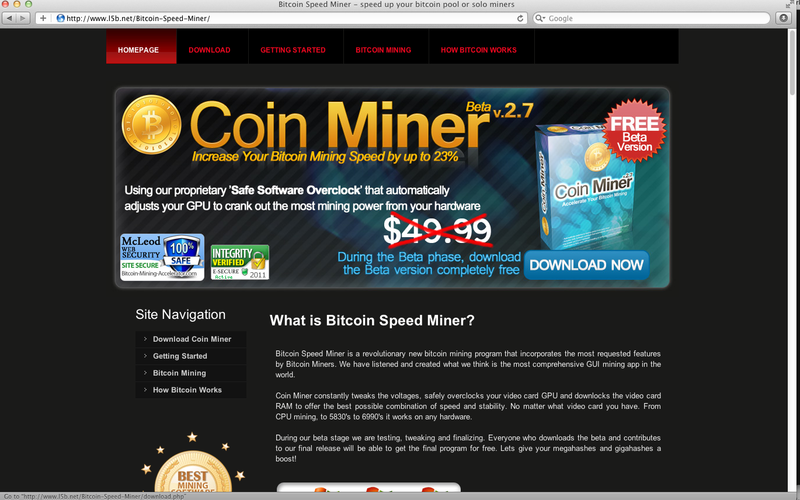 putting that much effort in to making a site and the malware, trying to scam joe public makes sense, but a few thousand geeky bitcoin miners? surely it's a joke. McLeod security? seriously? the email i got was quite convincing as well, but it just stunk of malware when i clicked the link. this is a screen grab of the site if you copy and paste the link. exactly. but copy and paste this into your browser url bar..
it loads right? they must be filtering referrers from this forum. hmm, if you copy and paste http://www.l5b.net/Bitcoin-Speed-Miner/ into your browser url field it loads, but clicking the link doesn't? must be legit. this email to my mtgox.com address legit? Sorry if i missed something, but can you please just give me an overview of why i should use this instead of GUIMiner please? Indeed. With my experience of graphics drivers causing BSODs, I reckon that could save me a few late night drunken trips on my bicycle down to the comms room to keep my new hobby going... There are other solutions (possibly cheaper, for 1 PC etc. ), but that's one I had that wasn't being used anymore. @sang. I feel your pain dude. Hope you got it running stable now. I'm new on the forum, but have been running a miner for the last 10 days and thought I would share a couple of tips that might help a few fellow newcomers. I'm a developer, so no hardware expert, but I have this running stable at 1.2GH/s. It's running in an air conditioned comms room (with permission, at work), so no elec costs, but with a 1KW PSU, it would be about 0.9 UK units p/h (at about 12p/unit, so about £80-£90 per month). I've also set my GPU fans to all run 100% all the time (noise isn't a problem and I don't want it to overheat), I realise this will wear the bearings in the fans out quicker, but it seems to me that I'm already late to the btc party and running it at full tilt now makes sense. I'm running Windows 7 x64, with GUIMiner and there are a few gotchas that I sorted and are the main point of this post. Simply put the following in a .bat file in your startup folder and after 30 seconds it will start the software. Just set all your pools to autostart and you're good. Another thing that got me on Windows 7 was Power Management. I'm used to Sever OSes, which don't shut down after 1 hour, etc. so this caught me out and I had to go back and sort it out the first time I left it running. Set Windows 7 Power Management to High-Performance and make sure you don't let it put anything to sleep. Because it's just a standard PC with no remote management I also plugged it into one of these that I had, so I can reset it remotely, which will automatically start it up and start it mining again, should it hang, BSOD, etc. One last thing was that connecting to it with RDP caused the gfx drivers to crash twice (I've not tried since then) and I lost the 2nd card each time (rebooting sorted), so I gave up on that and used teamviewer instead, which seems to work a treat for remote access.